Jasch Industries Ltd. is in portfolio of Subramanian P. He is one of the top investors in India. The company belongs to Plastics sector. As per the Company website it is among one of the major suppliers of Online measurement systems Worldwide having an installation base of more than 2000 systems. Below is list of product lines from the Company. The head office of the Company is in Sonipat Haryana. As mentioned above it has international offices as well. Lets first discuss the absolute return this Company has given over the years. 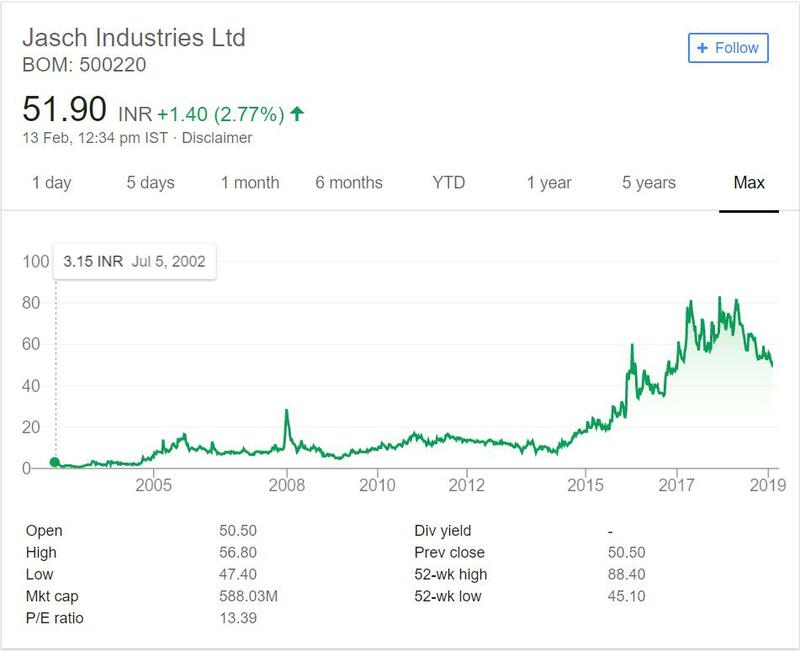 It was trading at 3 INR in year 2002.Now it is trading above 51. So it has given 17 times return in past 16 years time frame. It is decent return for small company like this one. There is no major shock except in year 2008. That shock was understandable due to Global crisis. Much of the price appreciation came during recent bull run before that it has given around 6 times return in past 12 years or so. Most of the time price movement was normal and nothing to be worry off. Jasch Industries Limited is in Plastics sector. That is broad classification. On narrow looking it specializes in manufacturing of measurement gauges for different industrial usage. This is niche operating space. Company growth is dependent on industrial demands and wide spread usage of these items in different industries. The past price performance was decent. It has presence in foreign market so exports will help Company increase sales and profit with time. It is too niche a sector so I am not expecting good growth going forward. The company may continue to post fair enough results and stock price appreciation. But there are better stock available which will give better results in long term.